Tired of looking out at your concrete patio? There are lots of concrete patio ideas for adding a bit more excitement and color to your backyard. Whether you are planning on installing a concrete patio or you have an existing one, there are several ways to make the most of it. If you want to upgrade or create a concrete patio, you can now engrave it, stain it, or resurface a plain old gray slab. 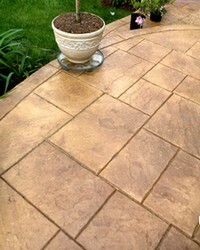 Any way you do it, your new patio will be a welcome addition to your home and your landscaping. Concrete stains now come in almost any color you can imagine. The stain is permanent, it won't flake or chip, and it can be applied to existing concrete as easily as if it were applied to new concrete. To be effective, the concrete must be porous enough for the stain to penetrate it, so if your concrete has been sealed, this may not be the best option for you unless you are also planning to resurface your patio. Stains will not mask cracks or other damage that exists in the concrete. You can resurface your existing patio with just a thin layer of cement-based overlay, which can then be stamped or engraved with a pattern, stained or stenciled. The results are amazing. Your patio can look like a complicated brick or cobblestone pattern, accented with colors, or many other options to choose from. No more boring concrete! The fresh concrete or the fresh overlay can be engraved, stamped or stenciled with patterns ranging from bricks and tiles to vines and fleur-de-lis. Concrete can now be textured, shaped, tinted and stamped with your choice of designs. Stamping uses rubber stamps to make the design, while stenciling uses paper stencils. Color is put in as the stencil is done, leaving realistic mortar lines that remain the original color. Your concrete patio may well become your favorite part of the yard once you've finished decorating the concrete. Once your patio looks brand new, you can start adding your plantings, your furniture and other elements to decorate your patio. Container plantings large and small can add to the new look of your concrete patio. Large containers can hold small trees or trellised vines. Large planters can help divide the patio into areas. Medium and smaller containers can hold perennials, annuals and even a few vegetable plants. These smaller containers can accent a patio set, a cooking area or a relaxation area if you have a couple chaise lounges or some Adirondack chairs. Another way to look at your patio... maybe you want to enclose it with a low framework with vines. Grapes, ivy, wisteria or any other climbing vine would make a lovely shady enclosure where you could enjoy outdoor meals without braving the merciless sun. Maybe you'd like a small water feature as one of your concrete patio ideas. Water features can be in a small tub with a fountain, or even a tabletop or wall unit. Water features can also include some plants or even fish if you use a whiskey barrel. Lighting is another element of your patio decor that can help create a magical effect. Outdoor patio lights can be either low voltage or solar, and can highlight artwork, plantings or your seating area on your patio. Speaking of artwork, have you considered what you'd like to include while going through concrete patio ideas? A well-placed statue or grouping of pots can really make a statement. Or maybe you'd like to really make a corner for your barbecue grill. Set up a table for food preparation, an area to hang your utensils... go all out. What else would you need to set up your grilling area the way you've always dreamed? On the other hand, maybe you are into gardening and would like a corner set up with a potting bench, some extra decorative pots, and all your gardening tools like your trowel, a soil scoop and your latest seedlings. That's the great thing about a concrete patio... it can be put to so many uses! It can fulfill any dream.